These double sided 14K yellow gold Celtic earrings feature white gold Trinity knots along with a 1/8" thick dimensional design. The lightweight and hollow Celtic earrings measure 3/4” wide x 7/8" tall and feature hoop style fasteners. 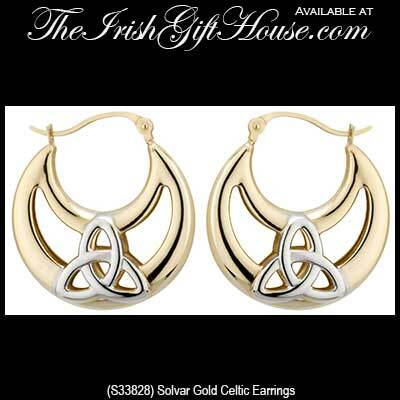 These Trinity hoop earrings are made by Solvar Jewelry in Dublin, Ireland and are gift boxed with a Celtic knot history card, complements of The Irish Gift House. 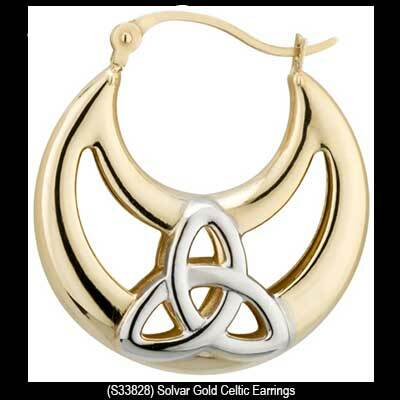 Gold Celtic earrings are a 10K half hoop style that feature CZ stones along with superimposed Trinity knots.